At Luxury Lanes & Lounge we have many different bowling leagues including traditional bowling leagues, different scoring methods like 9 Pin Tap (9 or more on your 1st Ball counts as a strike), different premiums (some leagues have cash prizes, some have bowling balls and other have fun licensed merchandise like Nascar, Nickelodeon etc..). You can even form your own bowling league. Leagues normally consist of weekly sessions at Luxury Lanes & Lounge that require each bowler on a team to bowl three games per week (or more/less depending on the league’s rules). Joining a league is a GREAT way to make new friends! If you do not have a team we can place you with other cool people like you, and in the type of league that fits perfectly. We have a league format at Luxury Lanes & Lounge that is just right for anyone! 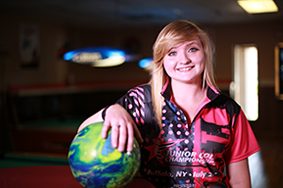 Whether you’re new to the sport or a seasoned bowler, Luxury Lanes & Lounge makes it easy to find the league to match your interests and skill level.